The Mesoamerican Registry of Attacks against WHRDs collects and analyzes data on attacks against WHRDs and their organizations in Mesoamerica—a region that includes Mexico and Central America—, and aims to assess the scope and types of attacks suffered by WHRDs, as well as to describe the main features of these attacks and identify their gender components. 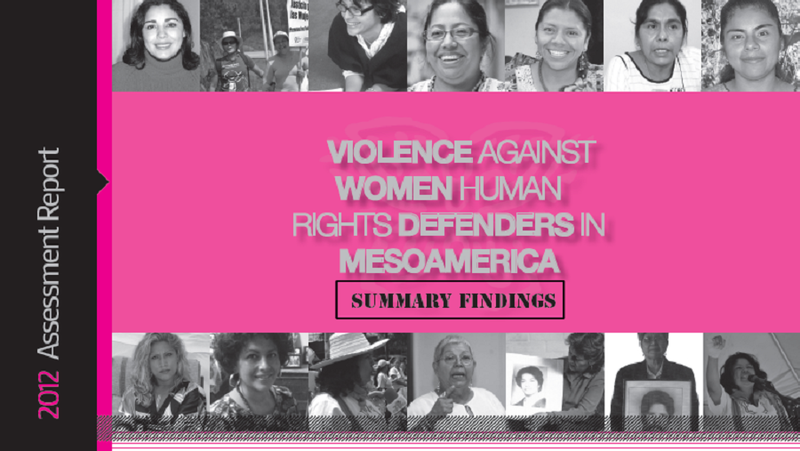 The 2012 Assessment Report is the first to make use of the data from the Mesoamerican Registry of Attacks against WHRDs, which was compiled from January to December 2012 in El Salvador, Guatemala, Honduras and Mexico. Data from the Self-Care Assessment, conducted by the IM-Defensoras in 2012 with 58 WHRDs in Mexico, Honduras, El Salvador and Guatemala, has also been incorporated into the report. Type of perpetrators: non-state actors such as family members, the community, organizations or social movements, and the defender’s partner. Types of rights defended, gender indicators include: sexual and reproductive rights as well as LGBTI rights. The national WHRD networks are responsible for gathering information on attacks in their respective countries. Each network has designated someone trained in basic digital security to submit the forms. Verification mechanisms are established in each country by local networks using established procedures. While the implementation of the Registry constitutes progress in addressing the issue of documentation, it’s important to underscore that underreporting of attacks occurs due to a number of factors. One factor is the difficulty many WHRDs face in recognizing and denouncing attacks. This particularly a challenge when attacks are perpetrated by non-state actors or are linked to gender-based violence that occur in their private lives, such as domestic violence or violence that occurs within the WHRD’s organization or political group.